We had an Anniversary Party for my parents and set one at each place setting (10 tables/100 people) with a personalized tag tied on with a white ribbon. It was so pretty with a wild flower in each vase. Each guest took theirs home as a favor. The variety of colors of the vases and flowers really dressed up the table (I purchased every available color). The vases were of good quality and value. We bought the vases for bridal shower favors. We put flowers in them and put them on the tables. Guests got to take one home. They were beautiful!! i bought these vases all in glacier white. i will use them for my daughter's baby shower decorated with her theme color ribbons. i will put babies breath flowers in them. one for each guest. they are adorable. I used these as party favors for my baby shower. I ordered white and lavender ones and bought some flowers to go with. All my girl friends at the shower loved the favors, most people have already found a good spot for the vase at home or at office. The vases were a little bit smaller than what I wanted. These vases with flowers made the perfect party favor for the guests at our baby shower. They added to the festive look and the guests were thrilled when told to take one home. I saw the example of another reviewer and filled them with 4 pom pom daisies, baby breath and green grass spikes. I tied a ribbon around that neck of the vase that matched the ribbon on the Diaper Cake. Each guest received this party favor with fresh flowers in them. 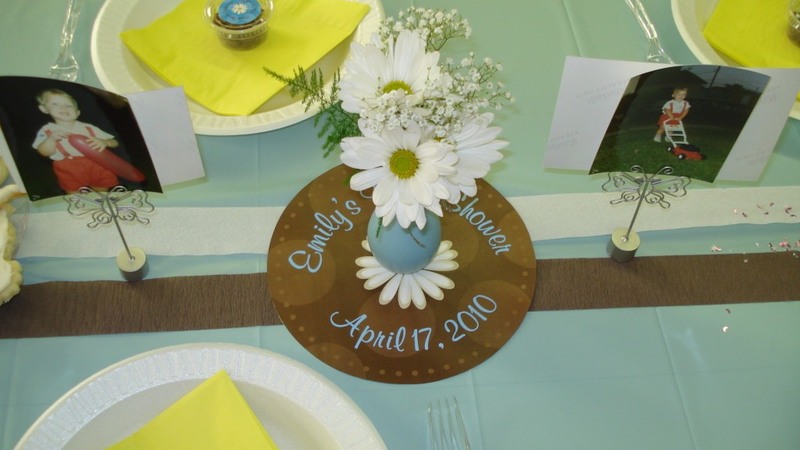 They were place on white linen tablecloths with handmade scrapbook coasters, which were round, square,or rectangular in shape in all different colors and personalized with messages. Each table looked exquisite. Thank you for making the party awesome!! I love these vases, elegant and very good quality! Using them for my childs baptism. I used the vases as a favor/table decor at a baby shower. The tables at the restaurant were too small for floral centerpieces so I filled the vases along with a greber daisy and fern-adorable! The guests were able to take the vase home as a favor and as a reminder of the event to reuse again. These vases are exactly as they appear on the website-no suprises. I used the vases for the table centerpiece and then gave them away as prizes for the name drawing. They are really cute but not practical at all. They easily topple over. We put flowers that were identical to the ones on the picture and even that was too heavy and it would topple. I wasn'r able to use after all because the diameter was just too small for what I had in mind. Just returned them back to you. They were beautiful but too small for what I needed. A little smaller than I expected but perfect none the less! Great value. We used this product at an employee celebration breakfast. We put one gerbera daisy and some tree fern in each vase. We set one out for each table setting and set them in a circle in the center of the table. It made an adorable centerpiece and then each person got to take one home. A perfect favor for almost any event. Can be used instead of or in addition to a centerpiece filled with a bud of the honoree's favorite flower. Wrap a name tag around the neck for a charming place card. Small enough to be carried away in a handbag, and beautiful, yet unobtrusive enough to complement anyone's decor. I used these at an appreciation luncheon. I prepped each with a single flower and put them at the place settings. They served as table decor as well as a simple item for take-home. These are unique and memorable. Rather than standard large vases and flower arrangements (which can be pricey), these stand out as something different. They were a hit! A wonderful favor that "decorates" at the same time. 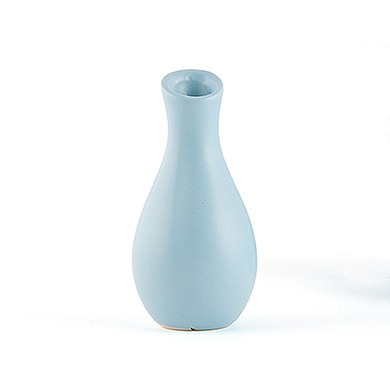 This pear-shaped miniature vase comes in five fashionable colors and has a silky smooth finish, making it a stylish choice for any celebration. Made of matte ceramic, vases are 4.5" H and come packaged in multiples of six vases per box. 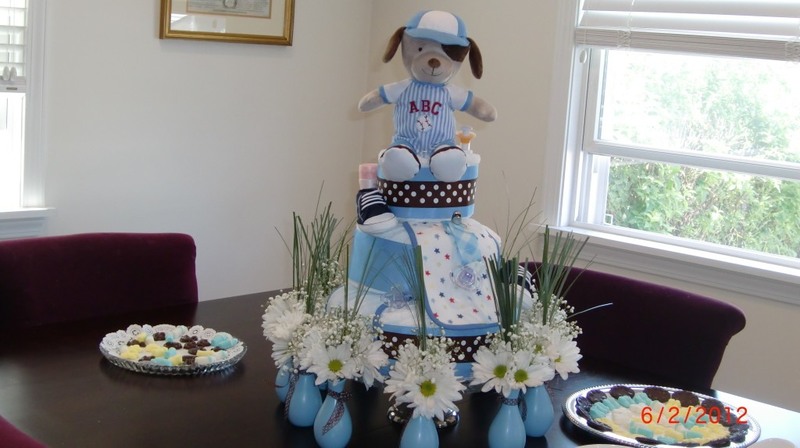 This is a very popular favor idea for baby showers. Weighs 4 ounces each. Available colors include: blue breeze, lavender mist, key lime, white ice, and glacier blue. Place a favor vase displaying your favorite flowers at each place setting or in multiples clustered at the center of the reception table. Attach a thank you message around the neck of the vase to add a personal touch.